Second Cambridge Analytica CEO Steps Down Amid Facebook Data Scandal : The Two-Way Alexander Tayler, acting CEO, is stepping down, according to a statement from the Cambridge Analytica board of directors. The firm is at the heart of a scandal involving the use of Facebook data. 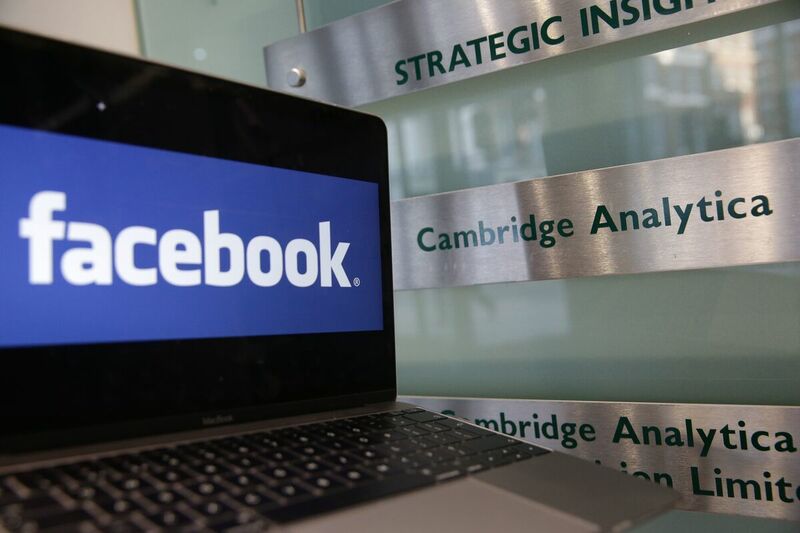 A laptop showing the Facebook logo is held alongside a Cambridge Analytica sign at the entrance to the London offices of Cambridge Analytica. The company's acting CEO, Alexander Tayler, is stepping down, and is the second CEO out since the data sharing scandal broke. The announcement comes during a moment of particular prominence: Facebook CEO Mark Zuckerberg is testifying Wednesday before the House Committee on Energy and Commerce, in part about that scandal. He testified in an hours-long joint session before two Senate committees on Tuesday. In March, Facebook suspended Cambridge Analytica from its platform after an investigation from The Observer of London and The New York Times revealed that the firm improperly accessed user data. Facebook users who downloaded an app developed by Cambridge University psychology professor Aleksandr Kogan gave personal data to the firm — as well as information from their Facebook friends who had not downloaded the app. Facebook said it learned of Cambridge Analytica's violation in 2015, and was told by the firm that the data was deleted. Those assurances may have been false. Cambridge Analytica has maintained that it deleted the data it received from Kogan's app when it learned that its retrieval violated Facebook's terms of service, and has denied that data acquired via the app was "used by Cambridge Analytica as part of the services it provided to the Donald Trump 2016 presidential campaign." Cambridge Analytica suspended its previous CEO, Alexander Nix, one day after he alluded to tactics of the firm that may have violated U.S. campaign finance laws in a hidden-camera expose by Britain's Channel 4. "His suspension reflects the seriousness with which we view this violation," the company's board of directors said in a statement. Rep. Eliot Engel, D-N.Y., asked Zuckerberg if Facebook was planning to sue Cambridge Analytica. "There were a number of other researchers who were building similar apps," Zuckerberg replied. "So we do need to understand whether there is something bad going on at Cambridge University overall that will require a stronger action from us."